Ohkay so, the writing of Fareesa Afzal & Wasiq Ali, direction of Furqan Adam & production of Moomal & Momina Duraid Productions; Meer Abru is a recent Hum TV drama that has been airing since last 4 weeks. I tuned to it because it showed up in my YouTube recommendation plus I wanted to watch something new & I actually ended up liking the way this drama was directed & how the story was unfolding. Meer Abru is in the initial stages but still, the first 4 episodes gave me enough reasons to continue watching it & also review it. There are a lot of characters in this drama & a lot of tracks which kind of make things quite happening & interesting. So, there’s the Murad family, which owns Murad Group of Industries & the sons of two brothers Jamal & Ghazanfar are now taking care of the family business. Jamal is married to Seemi (Jia Ali) & has two sons Saim Murad (Mirza Zain Baig) & Waleed Murad (Saad Qureshi). Ghazanfar is married to Saira & they have a son Meer Murad. (Noor Hassan). Ghazanfar & Saira have always had a troubled marriage because Ghazanfar could not accept Saira as his wife mentally & that has taken a toll on Meer because he grew up seeing his father being distant, aloof & angry & his mother being mistreated. Jamal is family oriented & believes in maintaining the family ties whereas Seemi constantly tries to convince her husband that he should part ways with his brother & get a new house for his family. Jamal pays no heed to his wife because he knows she is overly ambitious & not for any good reason. They all live together & all the cousins; Meer, Saim & Waleed are just like brothers. 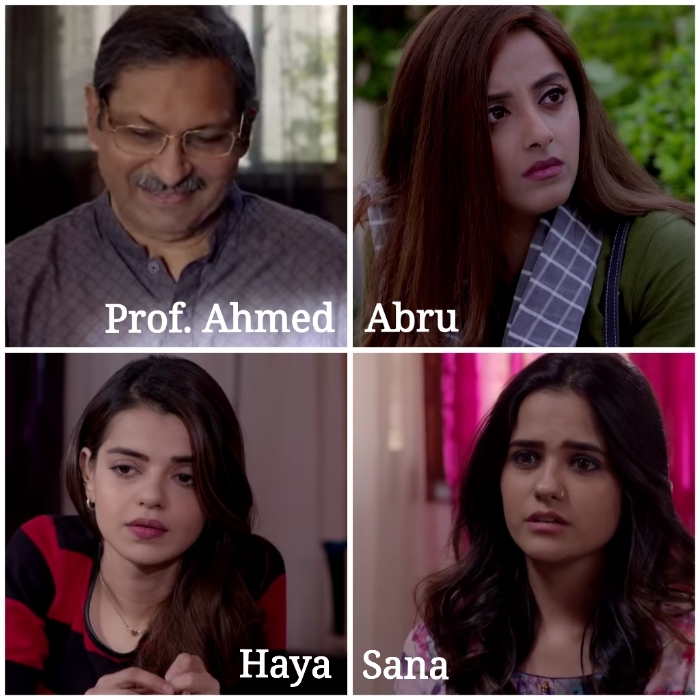 On the other side we have a family of Professor Ahmed who has three daughters; Abru (Sanam Chauhdry), Sana (Rabya Kulsoom) & Haya (Srha Asghar). Abru is the eldest therefore she is the most responsible & focused one whereas the younger two are still pursuing their education in the same university where their father is a professor & are care-free & happy-go-lucky. Abru & Meer have a very first interaction where they both end up leaving quite an impression on each other. Abru finds Meer rude & conceited whereas Meer develops interest in Abru but doesn’t really show it. Abru goes to Murad Industries to apply for the job only to find out that Meer is going to interview her. She goes back disappointed but Meer hires her as a marketing manager. Abru gets to interact with Saim but assumes that he is just an employee there but she later finds out that Saim is the part-owner of Murad Industries too. Abru & Meer always have a personality clash because of which Abru keeps on believing that her first impression of him was right but then even though Meer doesn’t really do much to change her opinion about him, he continues to stay reserved & distant. Meer develops feelings for Abru but doesn’t say much as he continues to see the budding friendship between Saim & Abru, which further pushes him away & does not allow him go change Abru’s perspective. Abru goes to Meer’s place to hand him some files & that’s when Waleed & his friend misbehave with Abru. Meer makes sure Waleed apologizes but then Abru thinks he staged it all to insult her. That’s also where she finds out that Saim is not just an employee but is a cousin of Meer. Abru gets a chance to interact with Saim’s family but that’s when Saim’s mother grows uncomfortable at the thought of seeing Saim being too friendly with a mere employee. Meer & Abru once again have a misunderstanding where Meer misbehaves with her. Abru thinks of resigning but seeing how she has a responsibility of her father & sisters, she drops that idea. Waleed, being a young spoiled brat has now taken it as a challenge to get back at Abru & that’s when he finds out that both Haya & Sana are Abru’s sisters. Quite carefully Waleed traps them both & makes them believe that he is in love with them while planting a seed of doubt in both Haya & Sana’s heart against each other. Waleed is taken to be as the heart-throb of the university so Haya already likes him but Sana also starts believing him that he must be serious about whatever he is saying. 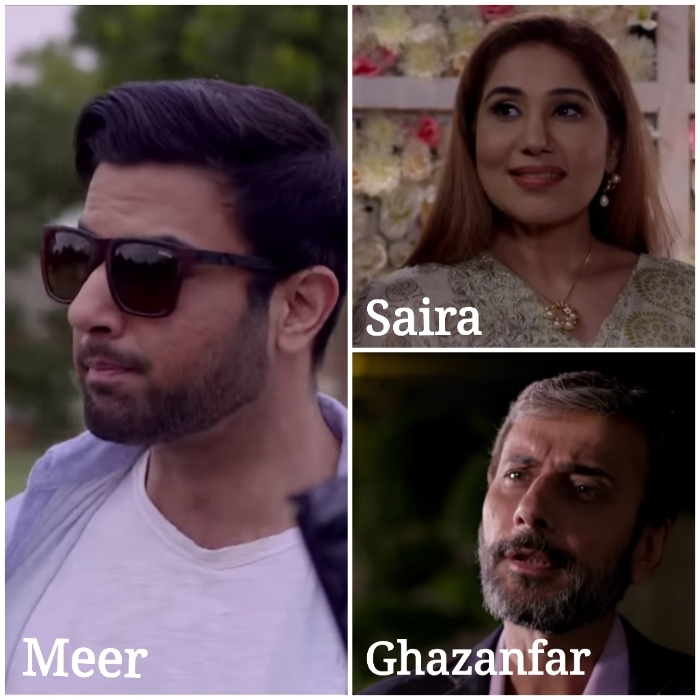 Meer Abru drama has a lot of characters & each one of them have gotten a proper introduction & coverage which also keeps the episodes engaging by offering quite a lot. Meer has really developed some insecurities & because of his father’s disrespectful attitude towards his mother, Meer also finds it hard to respect any female & continues to insult every other girl that he interacts with but later regrets what he has done. It is like he is having a constant battle within himself because he wants to rise above all of this but can not due to his personal life issues. Meer’s mother Saira has accepted all of this as her fate but then despite what Ghazanfar puts her through, she has found peace in the love & attention she gets from the rest of the family, especially all the boys. Saira is like a mother figure to all the boys & that is why they respect her a lot. Seemi on the other hand is quite social, so much so that she often compromises on important family event & prefers her social activities. Seemi is just as absent as Saira is present for her family, that is why even Seemi’s sons seem more emotionally attached to Saira as compared to their own mother. Saim & Meer share that kind of bond where they both can sacrifice anything for one another, this was something that was established in the initial episodes & that might be the reason why Meer has not told Saim that he has some feelings for Abru. Saim was trying to make up his mind but he & Abru have grown so comfortable with each other that he couldn’t help falling in love with her. For Saim it was a very smooth journey because he being a thorough gentleman treated Abru with respect & also because he was her friend, he was always there to help her. Considering how stern Meer was with Abru, she kind of relied a lot more on Saim because of that reason too as she felt easy & relaxed around him. This love triangle is definitely interesting & I want to see what the life has in store for them. Plus the equation that Waleed, Haya & Sana are sharing is going to get intense too & I am keen to see how Abru will deal with all of this once she will find out & will be forced to protect & save her sisters from the heartbreak. Meer Abru has offered quite a lot so far & overall it definitely is such a drama that is worth a watch. The characters have been written with a lot of detailing, I guess it shows the teamwork of the writers her. Despite the drama having a lot of characters, each & everyone gets a proper screen time & none of them seems to be a filler. Everyone has one thing or the other happening in their lives & it is all quite interesting to see. I like quite a lot characters which is one of the biggest reasons for me to continue watching this drama. I like how the vibe & feel immediately changes when both the households are shown – the vibe in Meer’s house is very formal, though loving & friendly but still very composed & on the other hand, Abru’s household is full of zest & energy because it’s filled with girls who are young & carefree. I like how Abru has a strong hold on her younger sisters & how they also obey her. Abru has earned this respect & she really is their support system. Abru’s character in general is beautifully written where she has her inhibitions & reservations but she tries to overcome them as she knows that she has two sisters who look upto her & that she has some responsibilities too. Overall styling & outlook of all the characters is really nice & I love Abru’s professional wardrobe, they have kept it very simple, effortless yet stylish enough. All the actors are looking amazing & the sisters of Abru are perfectly styled as university students. My main reason to tune to Meer Abru was Sanam Chaudhry because I enjoy her acting & she surely has not disappointed. It is good to see Noor Hassan in a drama too after quite a while. 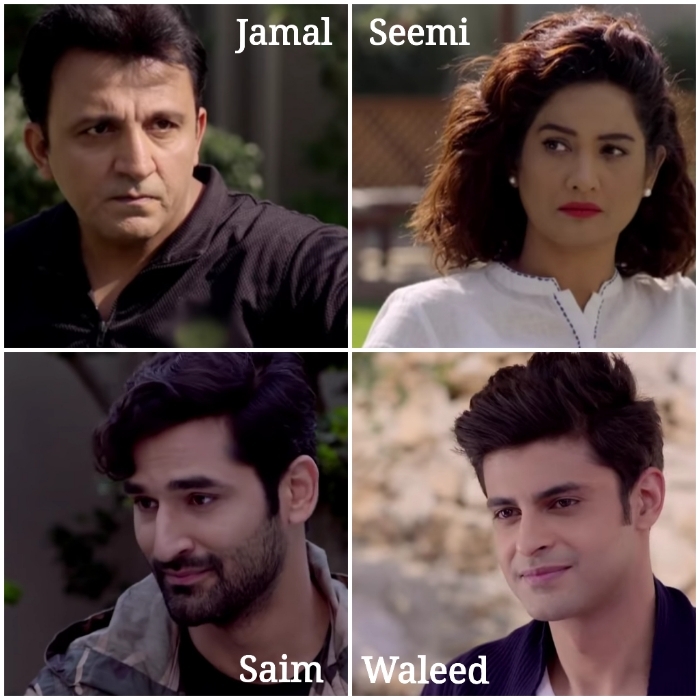 Zain Baig, Saad Qureshi, Rabya Kulsoom & Srha Asghar, all of them have done a commendable job & I believe the credit also goes to the director for keeping things so effortless & amazing – especially the acting of all the actors. Definitely looking forward to what more Meer Abru has in store for us. Please share your thoughts if you have watched this drama & if you’re someone who’s on the fence about it, I highly recommend Meer Abru.